If the same type of valence bond isomerism were to occur, we would now have three C≡S triple bonds swapping places with three CS single bonds, a sort of super version of the notation normally shown for benzene itself. If the barrier to this swapping is finite, then the interconversion shown above would be a proper equilibrium (the top arrows), but if there is no barrier, then the interconversion would be a proper resonance (the bottom double-headed arrow). Another way of posing the question is whether the so-called Kekulé vibrational mode (which in effect represents the motions implied above) has a negative force constant or a positive one respectively for the two sets of arrows shown. A B3LYP/cc-pVTZ calculation (DOI: 10042/to-3646) reveals that the optimized geometry exhibits six equal SC bonds, all 1.616Å long. Typically, a single SC bond is around 1.82Å, a double 1.65Å and a triple is about 1.5Å at the same level of theory, so this C=S bond is clearly at least a double one. 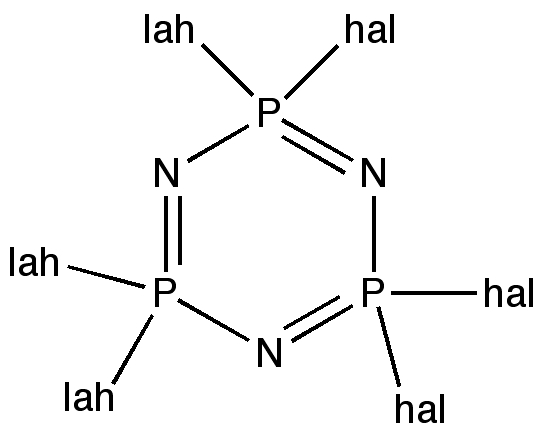 A NICS(0) calculation at the centroid has the value of -14.6 ppm, which indicates aromaticity. We conclude the appropriate arrow above is the bottom resonance one, rather than the top equilibrium one. This is confirmed by finding that the Kekulé vibrational mode has a strongly positive force constant (ν 1083 cm-1, animated in 3D model above), which contrasts with the negative value (ν 284i cm-1) found for bond shifting in F3S-C≡SF3 itself. Again, comparison indicates that a C≡S triple bond has a frequency of around 1400 cm-1 and a double around 1200 cm-1 (the degenerate C=S non–Kekulé vibrational mode for this system is indeed calculated at around 1225 cm-1). So to summarise; a single F3S-C≡SF3 unit reveals very strong bond alternation, and negative force constant (transition state) for interconversion of the two bond forms, but a cyclic form reveals the opposite behaviour, with no alternation and instead strong aromaticity. In part this difference in behaviour must be due to the constraints on the geometry of the cyclic form. F3S-C≡SF3 interconverts via a highly twisted geometry with C2 symmetry, and this twisting is not exactly possible if you create a cyclic equivalent. In part it is also due to the aromatic stabilisation energies. In the resonance above, you should be able to count a total of 12 electrons involved! Nominally, if you try to apply the 4n+2 aromaticity rule, it does not fit, until you realise that in fact you must be dealing with two sets of 6 electrons. The system in fact is a classic double-aromatic, in which six electrons circulate in the plane of the molecule (the σ-set) and six above and below (the π-set; the MOs for the molecule confirm exactly this interpretation). Notice how this itself contrasts with a similarly aromatic system, the atom swapping in three nitrosonium cations, where the Kekulé mode force constant was strongly negative. To complete the analysis, the ELF basins (above) reveal the six SC regions to each contain 2.7 electrons, together with three carbon carbene monosynaptic basins. For comparison, a system with a high degree of SC triple character (HCS+) has around 3.8 in the SC region. Perhaps a better model is TfOSCH (for which the carbon also has a carbene lone pair), which has 2.6e in the CS region. The carbene lone “pair” for the present molecule integrates to 2.6e each, which totals to a nice octet of electrons around each carbon and to around 7 for each S, confirming that whilst the S is hypervalent, its valence octet is not expanded!). This ELF picture does rather tend to confirm the original resonance structure representation shown at the top. All that is needed is is for someone to make this molecule to confirm its properties. Perhaps by trimerising F2SC, itself formed by cheletropic elimination? It is worth noting that the iso-electronic P/N (e.g. of S/C) analogues are very well known. This entry was posted on Friday, January 1st, 2010 at 12:44 pm and is filed under Hypervalency, Interesting chemistry. You can follow any responses to this entry through the RSS 2.0 feed. You can leave a response, or trackback from your own site. 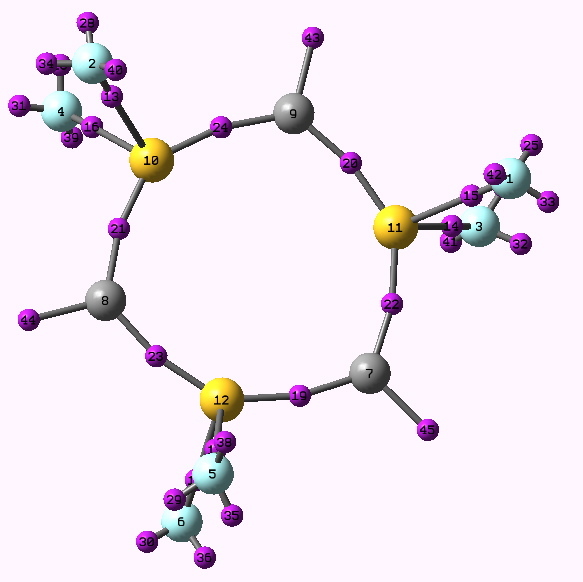 Contriving aromaticity from S≡C Triple bonds is licensed by Henry Rzepa under a Creative Commons Attribution-Noncommercial-Share Alike 3.0 United States License.